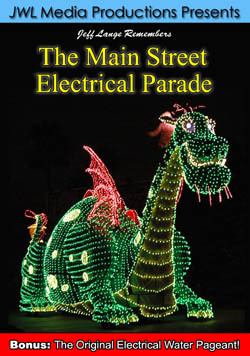 Jeff Lange Remembers: The Main Street Electrical Parade DVD – Released Today. To purchase this new JeffLangeDVD title, click this LINK. Windsor, Conn. (August 8th, 2008) -Today, JeffLangeDVD has released their latest title, Jeff Lange Remembers: The Main Street Electrical Parade. Jeff Lange takes you on a trip back in time to experience the evolution of Disney’s beloved nighttime classic, “The Main Street Electrical Parade”. “Ladies and gentlemen, boys and girls… Disneyland proudly presents our spectacular festival pageant of nighttime magic and imagination in thousands of sparkling lights and electro-syntho-magnetic musical sounds…The Main Street Electrical Parade!” This is where it all started, recorded live from Disneyland’s Main Street USA! The Disneyland Main Street Electrical Parade ran from 1972-1996. This is the original Walt Disney World version of the Main Street Electrical Parade that ran from 1977 to 1991. All of your parade favorites are here, including the toy soldiers from “Babes in Toyland” and “It’s A Small World”. This current version of the parade, recorded with the beautiful Paradise Pier nighttime lights as a backdrop, opened in 2001 and includes all the classic floats. A predecessor to the Main Street Electrical Parade, this incarnation of the popular nighttime show took place on Walt Disney World’s Seven Seas Lagoon and Bay Lake. This original version premiered in 1971, and features colorful, lighted floats depicting King Triton and an assembly of sea creatures – concluding with a patriotic finale! Relive these classic Disney nighttime memories year after year or experience the magic for the first time by purchasing a copy of “Jeff Lange Remembers: The Main Street Electrical Parade”. Click here to browse all Disneyland titles. Click here to browse all Walt Disney World titles.